Kimmerer’s words have reference to a process of natural resurrection that is fitting to ponder this Easter day. Death in this case does not refer to the natural cycle of life and death—but a chemical death perpetrated on Lake Onondaga such that life seemed no longer possible there. Lake Onondaga was the site of some of the worst chemical contamination of industrialization. It is also a place sacred to the traditional Onondaga. Their love – a term Kimmerer is not afraid to use—for this lake motivated a plan for clean-up and restoration in the worst of circumstances. Thus the Onondaga went to court not to plead their case for regaining ownership of the lake and its surrounding land, but rather, their right to protect and restore it. Though they have certainly won their suit on moral grounds, the US Supreme recently refused to hear their claim. Now they have taken it to the International Human Rights Commission. And though they did not sue to retain land title, some local land has been gifted to them anyway. The Onondaga face a daunting task in caring for their traditional homelands. Their lake is not only an ancient Onondaga sacred site, but a Superfund site. The soil surrounding the lake is chalk white from chemical contamination, and the rains saturate the water table, bringing more of those same chemicals into the lake. For a time it looked like the waters of Onondaga could support neither plant nor animal life. But with care, things began to turn around. With the dredging out of some contaminated soil, the closure of nearby factories, rebuilding of local sewage systems, planting willows to soak up contaminated water before it leeches back to the lake along with native salt-resistant plants (some of which have survived the chemical-laced soil), and windblown seed taking root on patches of polluted land–and traditional dancing on the lakeshore in prayer for the restoration of the human-land relationship here– the lake waters and surrounding lands have begun to support life once again. There are even small numbers of trout in the lake and eagles overhead—though eating the local fish is an iffy proposition with respect to the health of those eagles, as is swimming in the lake to the health of humans. But as Kimmerer asserts, it is not “the land that has been broken, but our relationship to it”, and when that relationship is restored, miracles of resurrected life take place. In places, the chemical-laden soil supports green life again—even an unlikely and revered patch of Sweetgrass. Healing the wounds created by human misuse is a slow process. And one that should not obliterate our memory of the results of our actions. Kimmerer thinks it would be good for some small portion of that dead soil to remain as a monument to what humans should avoid. The granulated soil the ants have mounded around the[ir] hills is white as snow. Grain by grain, in their tiny mandibles, they are carrying up waste from below and carrying seeds and bits of leaves down into the soil. The grasses feed the ants with seeds and the ants feed the grasses with soil. They hand off life to one another. Leaf by leaf, root by root, the trees, the berries, the grasses are joining forces, and so there re birds and deer and bugs have come to join them. And so the world is made. And so the world is made indeed. So it is also remade each spring with the exuberant bursting out of life. Just looking at the irrepressible green everywhere makes me smile and come down with “spring fever” that makes it nearly impossible to stay indoors on any passably warm day. Currently, I am watching the pageant of diversity in my backyard with its myriad of tiny ecosystems—and plants making decisions about when to show themselves in each of them. Fifteen feet away from one another, one serviceberry is in full bloom and another’s buds are barely swelling. One of my favorite pastimes is wandering through my small urban yard, watching the surprises seeded there by animals or wind—or the sheer persistence of plant communities. A patch of the native salal I am trying to establish has cooperated in a way I never expected. It ran under three feet of cement sidewalk and popped up on the other side where it will certainly begin to spread itself beyond my hopes. Natural resurrection is a sure thing as long as we keep our part of the bargain. This particular Easter the weather is also a good reminder of what we humans do not control. The day was marked by a hail-bearing thunderstorm with flashing lightning, coming on the heels of near freezing overnight temperatures. We had such an early warm spring last month (causing many blossoms to burst out) and such cold rainy weather recently (keeping the pollinators in their nests and washing out the blooms), I wonder how our fruit will be pollinated. Yet I have noticed that whereas some of the younger local fruit trees burst forth at the first sign of warmth, others of the same species hold back and come later, like my own apple and plum and cherry—and thus they are more likely to get themselves pollinated. I can’t claim to understand this. Have the elder trees in my yard learned from experience? Can they read the weather better than the newcomers? In line with botanist Matthew Hall’s analysis of “plants as persons”, they are also certainly decision-makers in ways we don’t understand. “Going on the side of life”, as indigenous elders framed their ethical responsibility to the world that sustains us, means assuming the stance of humility in our partnership with other lives. Allotting them such decision-making capacities. It also means facing the effects of our own actions on those other lives even when it makes us uncomfortable and brings us hard choices. Sadly, there is great grief today in facing what we have done in the world: in climate change and species extinction, for instance. But the Onondaga show us what it is to work to heal what we have done. And when we do our part, as Kimmerer notes, the land does its. For whatever is lost, there is also what is found. These are things that call for celebration as we stand on the side of life. They are gifts, small and large—and often wondrous and mysterious as our natural partners surprise us with their uniqueness and resilience. These are things we should not fail to celebrate, for they give us essential perspective in our responsibility for loving this world. Since Francis Bacon, the father of modern science, declared that humans should do things because they can do them, our technology has taken on a double life as hero and villain. On the one hand technology is the hero in the story of progress, in which it assumes the power to shelter us, feed us, and extend our lifespan. In this heroic guise, technology conquers nature and harnesses it to human ends. However, to conquer nature we must not only conquer our natural selves but override the natural order. Technology conceived under this worldview has led to climate instability, the destruction of vast quantities of ocean life, toxic releases into our environment and accompanying cancer epidemics, persistent loss of soil fertility in industrial farming, and loss of the biodiversity that underlies the resilience of natural systems. 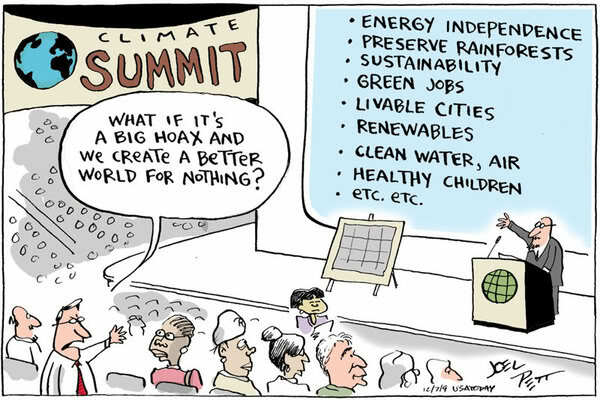 In the face of such crises, some resort to denial—denying that human actions contribute to climate change, for instance. Media financed by corporations dependent on current technologies have a hand in this: whereas a recent review of peer-reviewed papers in science journals found 97 per cent of them took climate change as a given and focused on tactics to deal with it, over forty per cent of media stories in the same period focused on climate change “skepticism”–giving the impression of doubt in the scientific community that does not exist. Such publicity also supports the idea that we can fix our problems with more of the same: fantastic technologies to set mirrors in space to control the sunlight falling to earth, for instance. It presents technology as eventually winning out if we just keep at it. By this reasoning, it is okay to amass nuclear waste on faith that some generation in the future will figure out what to do with it. In the context of overwhelming environmental crises, by contrast, many see technology as a villain. They would return to a time “before technology”. But technology itself is nothing more or less than a tool. In fact, we became human through the technology of culture: by passing down our knowledge and experience between generations. There is no human society without technology to return to. And importantly, conceived as either hero or villain, technology is both larger than life—and impervious to choice. In his historical analysis of modern technology, Ulrich Beck argues that when we create technology without designing standards for it. the very technology that was meant to free us becomes a kind of fate– spiraling out of control. We must remedy this by choosing the kinds of technology we will accept in order to fulfill the UN’s classic definition of sustainability: that the current generation of humans meet its needs without compromising the ability of succeeding generations to meet theirs. As Amy Kocourek indicates in her comment here, this brings up the important issue of our definition of need. Sustainable technology can never meet the needs of ourselves and of future generations if it seen as simply a new way to maintain the consumerist society we currently have. Here are my suggestions for the criteria on which we might base that choice. Using a tool in the dark is dangerous for both ourselves and our world. Too often, technology (the food processing industry, modern sewage systems) disguises our relationship to the natural lives upon which we rely– and the results of our actions on these. The contrast between the technology that distances us from the results of our actions and technology which brings us closer to them is illustrated by the difference between the “readiness to harm” flowing from the invisibility of nuclear hazards outlined by Arjun Makhijani, and Siletz Takelma elder Grandma Aggie’s technology of story, which brings us face to face with the effects of our actions on other species and other nations. In the one case, dangerous technologies spring up in the breach between our action and our perception: in the other, technology fosters the careful observation and compassionate care that led to sustainable indigenous practices persisting for thousands of years. Though it is unlikely that each of us would be able to become experts in the range of technologies used by our current society, this rule implies public transparency of an industry’s processes. There is a reason why Polyface Farm, with its emphasis on sustainability with its careful modeling on natural system, places transparency as its first principle, and by contrast, the commercial US meat-packing industry fought not merely to keep visitors out of its premises, but to keep pictures of its processes private. Knowing what goes on in the technology that produces our food or energy tends to lead to more responsible– and healthful– choices. This rule is related to the public’s right to know, following current right to know initiatives like that in Eugene, Oregon, which requires business reporting of toxic releases. Over time, such data allows for the analysis of environmental effects of particular chemicals. It also motivates businesses to become leaders in developing and using processes that they are proud to showcase: as in the case of Forrest Paint in Eugene, which has become a national leader in recapture of chemicals in paint manufacturing and re-constitution and re-use of leftover paint products. (Thanks to my student Neyssa Hays whose comment below reminded me to draw out this guideline in further detail). In using resources from natural systems, we must follow nature’s debit system. Human technology is capable of increasing the long term abundance and fertility of natural systems by returning to them more than it takes, as illustrated by the indigenous botanical practices in the Pacific Northwest—or the restoration and recovery of lands in Bangladesh and Mexico though indigenous agricultural methods. In contrast, industrial agriculture is highly unsustainable in its failure to pay its natural debts. Soil scientist Fred Magdoff details the negative feedback loop in which such agriculture compensates for the declining soil fertility it creates though injections of energy (chemical pesticides and fertilizers) from without. There are many ways to be clever about this: as in the recent idea for chemical-free pest management in rice fields that both raises soil fertility and cuts waste. Growth is an aspect of the natural world that expresses its fecundity. But natural communities grow through transformation, exchange and creation of diversity—not by the accumulation of material goods in a way that toxifies, removes, or ties up the stuff of life away from its natural community. We must grow within the context of natural systems: following the model of “natural capitalism”, for instance, we would conserve material resources and grow human ones such as knowledge and craft. The former are limited; the latter are not. In honoring natural limits, sustainable technology must use renewable energy sources (this addition courtesy of Amanda Wilson) and/or put back what it draws from natural systems (courtesy of Brandt Hines). This is the primal wisdom of societies who saw all natural lives as their kin: for hundreds of millions of years, ecological systems have developed in balance and concert so that all lives recognize each other in their physical make up, fitting together as the family of life. The precautionary principle states that we must not release new technologies into the environment until they are proven safe. This reverses the usual practice in the contemporary US, in which chemicals, for instance, must be proven dangerous before we stop their release. The precautionary principle is a way of extending our care into the future, as “fore-caring”. This principle honors human ingenuity with the faith that we can observe our world with care and act with finesse. This is a principle of justice as well as ecology, which inhibits the creation of profit for some by transferring harm to others. This simply follows the model of natural systems in which waste produced by some always equals food for others. This means that any heavy metals, etc., used by a particular technology must not be waste: they must be safely re-captured and reused. Whereas sustainable technology cannot turn food or energy into waste, it can do the opposite: catalyze the turning of waste into food. Bringing the leaves from my neighbors’ trees that our city would otherwise haul away onto my yard as food for the soil is an example. The city of Olympia, Washington does this on a larger scale, hauling away all forms of kitchen and yard waste to a business contracted to turn it into compost. Resilience is intimately linked to biodiversity through a simple bottom line: the more choices one has, the more options with which to survive stress. In honoring diversity, technology should be specific to place, responding to the irreplaceable specificity of the land—and the lives of all species that have thrived on it. What would you add to this list? Which particular technologies ought to be included or excluded on these grounds? If society does not choose its technologies, as stated at the beginning of this essay, it becomes governed by them. Technology that is readily understandable and user friendly is key to being able to choose it– or reject it– according to its effects. This is an issue central to the democratic nature of sustainable technology. In the words of OSU student John Aldridge, “It is important that highly-industrialized nations recognize their moral obligation to pay their environmental dues” by making sure that the technological “help” they provide other nations passes the “litnus test” of being environmentally sound, as well as being freely accepted by and “consistent with the worldview of the receiver. “Furthermore”, Aldridge continues, “developers and distributors of technology should not market their tools as exclusive goods. If a nation is in need of a good, it should be available.” This means, for instance, that patent laws should not stand in the way of health or environmental sustainability. If developers and distributors do not wish to follow the model of Gaviotas and make their developments patent-free, they can at least avoid the actions of the pharmaceuticals who sued South Africa for patent infringement when it developed an inexpensive antibiotic to prevent infant deaths. Further, technological development must not infringe on other populations by using their DNA for genome research or their traditions for profit without their knowledge or economic compensation. In terms of patents in general, Vandana Shiva’s standards in the “no patents on life” campaign is a good way to avoid patent abuses such as that in which a US firm patented the basmati rice that was developed in India– making it “illegal” for its own originators to use it without paying this firm. Mr. Unger sees this as part of sustainable technology’s appeal to the “mass consumer”. I see it as something more. It is important that technology be available to the larger portion of humans rather than only to the upper or elite class. As the community of Gaviotas indicates in its refusal to patent any of its inventions, sustainable technology should be grounded in its values and effectiveness–in its use for all– rather than profit for a few. To make technology cost effective, the US must cut its “perverse subsidies” that result, for example, in fresh local food raised organically and purchased locally being more costly than highly processed and packaged food transported over thousands of miles. Without “perverse subsidies”, sustainable food production would be less costly (and thus more readily available to all), since it has lower costs of transportation, packaging, advertising, chemical and fossil fuel inputs, than does highly processed food. There is a parallel case to be made in the example of energy: if we cut massive subsidies to the fossil fuel industry and price technology at its true environmental and health costs, other energy producing technologies would be cost effective in comparison– including the most important energy producing tact of all– conservation. And since nuclear plants are so expensive to insure, they would never be built without their government subsidies. As Laura Zeljeznjak notes in her comment below, another aspect of this cost-effectiveness is that sustainable technology should be cost-effective for the natural world. It should be made or drawn from sustainable materials rather than those and use up rare and irreplaceable resources, as well as ravaging other natural lives and their habitats. Altogether, the “pricing” of sustainable technology must follow an emphatically different model from technology based on “profit” for its developers (or in the case of patents on particular natural products, its self–proclaimed “discoverers”). As discussed in the “The Trouble with Progress”, technology driven by the profit motive has succeeded only in ravaging the planet and undermining our relationships with other lives, human and more than human–and thus is the opposite of sustainable options. We belong to this world, whose history has gifted us with our intelligence and our capacity for care. We must accept this tremendous gift and bear it with the honor it deserves for the sake of all the lives who share our world. Polyface Farm, for instance, has developed an agricultural model that fulfills all of these criteria. Gaviotas in Colombia has developed an entire community grounded in such principles, still going strong after over 40 years. And then there are the sustained yield forest practices of the Menominee Tribe. Any examples you want to add here? Grandma Aggie’s words are featured on the theme page of the latest issue of YES magazine’s “water solutions issue”, which is full not only of ideas but good news in ways that small communities have made headway against corporate ownership. Here are the words Grandma Aggie is fond of saying: “We are all water babies. It’s never too late to save the world. Wherever you are, take care of the water- if you really want to live”. 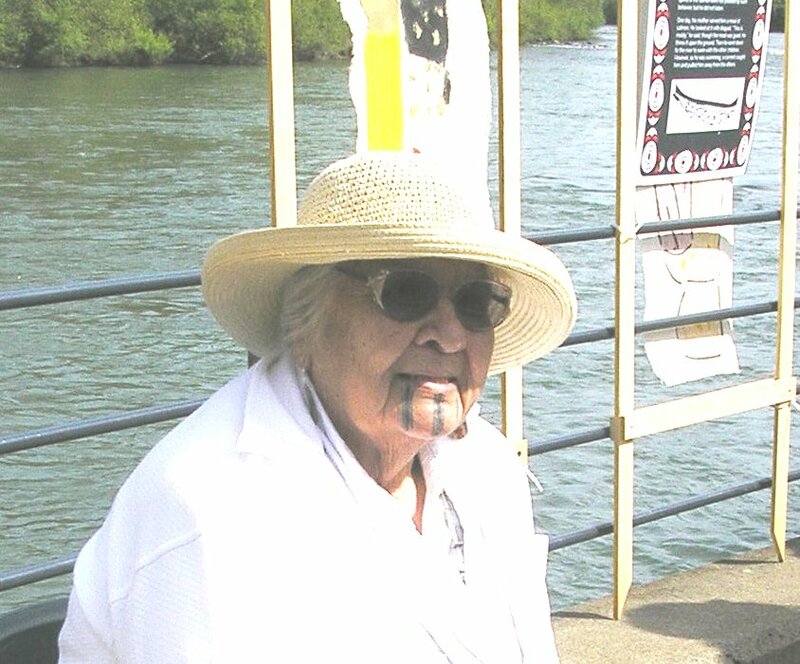 This past Sunday, Takelma elder Agnes Baker Pilgrim, chair of the Thirteen Indigenous Grandmothers came to Eugene to lead the third annual honoring of the water ceremony to bless the Willamette River. Grandma Aggie smiles after traditional drummers from the Cottage Grove Longhouse sang and drummed to the river while she prayed. Afterwards, others shared songs and poems in honor of the river. Grandma Aggie reminded us we are all “water babies”, instructing us to “introduce ourselves to the water” as a way of thanking it and blessing ourselves. Each of us touched the water on the bowl in the chair beside her before she gave it back to the river along with water from all the rivers of the world she personally gathered in her travels. Grandma Aggie shared her concern for the rivers that she witnessed drying up in Australia in the past few years since she had last visited there. She observed that perhaps Mother Earth is taking the water back, since we are not treating it properly. She reminded us of all the ways water sustains and enhances our bodies and set out concrete tasks for those present, such as finding out how the water from things such as carpet cleaning gets disposed of– and making sure it does not contaminate our water in the process. Grandma Aggie also listed some of the ways in which we should continue to be grateful for the lives that supports our own, giving the example of the “one leggeds”– the trees whose bodies built her house whom she daily thanks. She takes heart that honoring our rivers is catching on: she has been asked to lead a similar ceremony on the Columbia and in Eastern Oregon. 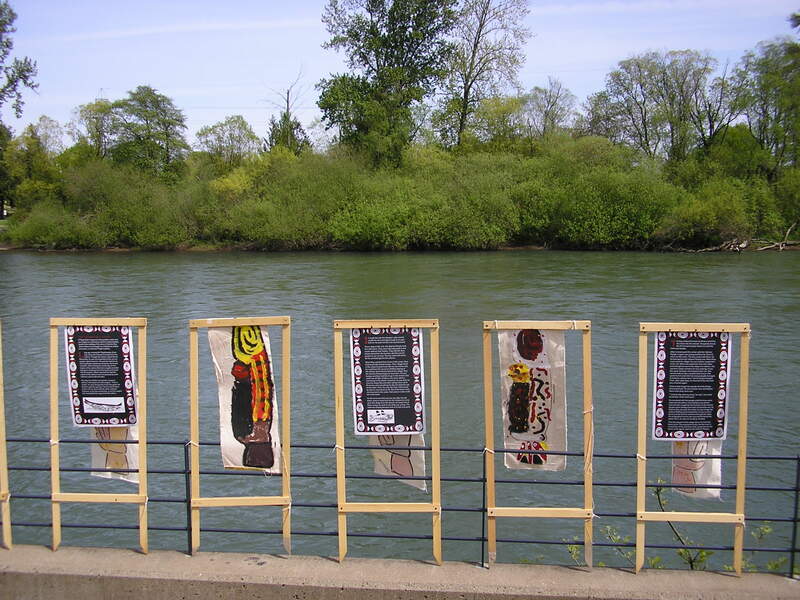 In the back along the river behind Grandma Aggie you see these banners placed by the Fresh Water Trust of Corvallis in honor of Earth Day. 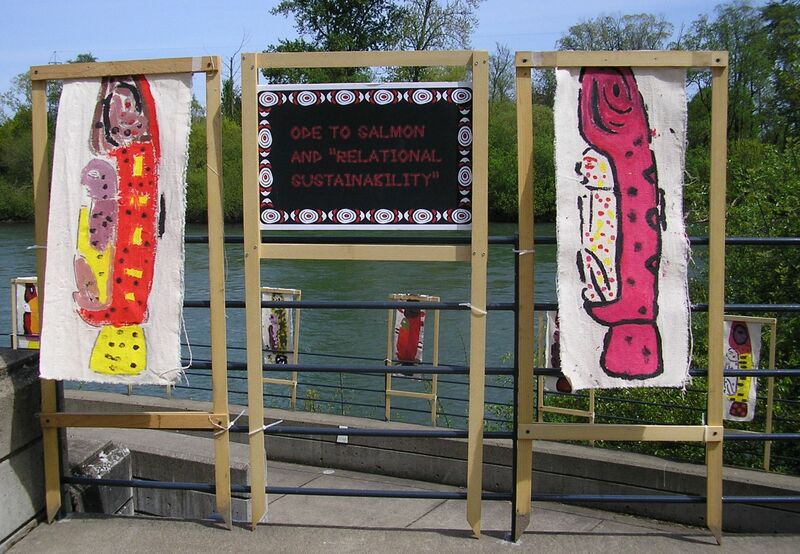 Each of these gorgeous banners was designed and painted by a middle school student in honor of the salmon celebrated by the traditional Tlingit story of Salmon Boy. “The Salmon River banner is inspired by a salmon trap stake, crafted and then fastened upright to a fish weir by a Tlingit trap owner who would place the stake and weir near the mouth of a salmon spawning stream. Doing this represented the highest value of respect to other humans and the valued and necessary salmon. What would the jumping salmon see? A wonderful fully crafted representation of the Salmon Boy story, an announcement of the knowledge of and intent to abide by the requirements of that charter. But further, this is an object of great beauty and wonder, something that the salmon would appreciate in its own right as well as reflect upon the respect demonstrated by the state presenter through the exquisite quality of the carving. In this way, it is not a representation to “lure” or “attract” or even merely a “reminder “, more a statement of intent to insure the sustainability of a species. 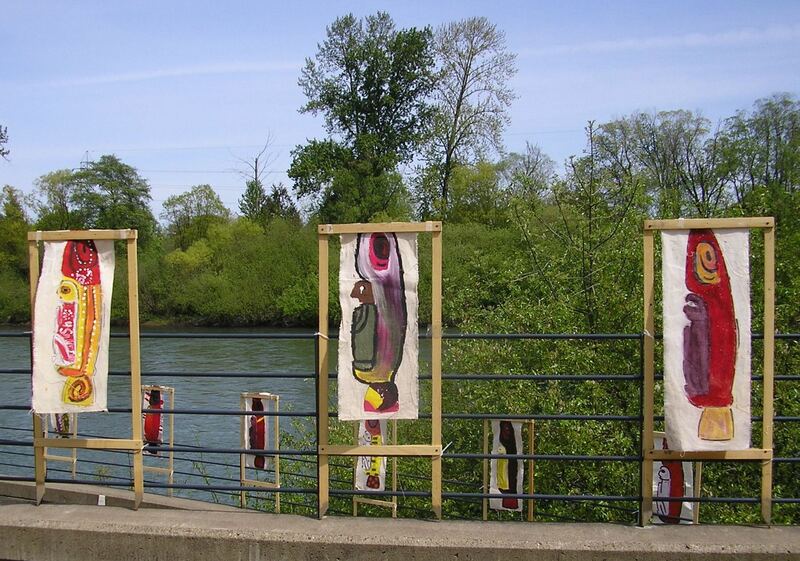 The Salmon Banners represent the image used on the trap stake, so in the event the salmon do return, they are given a gift of beauty to behold, offered by those how seek to sustain a relationship and welcome them back. It is a testimony to the power of the mythic charter to generate behavior by humans that respect salmon. -Eighty-two year old Tlingit elder James Osborne. Any of you in the Eugene area will not want to miss the stunning exhibit, “How Water Speaks to Us” , at the Museum of Natural History through June 13. Just after the US set up their space program, NASA hosted a group of Asian scientists, treating them to a tour of their facility– with which the visitors were duly impressed. There followed a presentation of the benefits of Western science, during which the NASA administrators touted the importance of specialization. To me, that is one of the central questions of the modern age. There is an ancient answer to that question, in the storytelling technology that bridged so many aspects of the world, bringing them together. Such stories bridged generations– and brought human culture itself into being. Though we might not recognize passing stories between generations as a technology in the age of digital phones, such stories are the basic human tool that empowered us to expand our reach in both time and space. This technology is a powerful tool for not only bridging generations, but for linking human life with the larger community of natural life. When Siletz Takelma elder Agnes Baker Pilgrim tells the story of the salmon’s struggle to return to their home waters to carry on the the generations of the salmon people, that story brings humans and the salmon into special solidarity. Such stories not only bring communities together across generations and species. They have the potential to bring us from times of relative hopelessness and fear into vision. Children would “pay” for stories by doing a task designated by the storyteller. The nurturance and wisdom of such storytellers was signed by the tasks they designed for these children. A child afraid to go to a certain place in the woods, for instance, might be told to fetch a stick from a place nearby–and then to repeat that task until he or she drew so near to the feared place, their fear would disappear. Thelma Adamson’s Chehalis fieldnotes (drawn up in 1926) record the profound insight that the power of our past will haunt us until we turn and face it. At that point it will become a vision power for us to use. There is working knowledge here of the links between past and future– between wisdom learned from our past and vision for the future. There is the working knowledge of how human generations depend upon and may nurture one another. According to Jacob Bighorn, former administrator of the Chemawa Indian School, Native American education works from the premise that each child is given a natural “life plan” by the Creator that is theirs alone. Certainly, giving children the understanding that each of their lives is a unique story the Creator waits to hear is an antidote to any future smallness imposed on them. In this context, education is a “natural process” of supporting the child as his or her spirit-calling emerged. 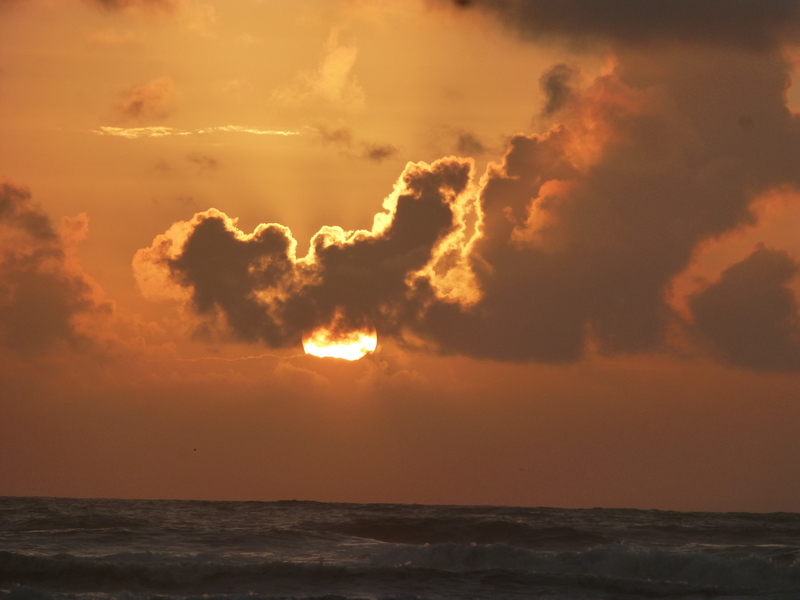 In cultures throughout the world, the time of year surrounding the winter solstice is the season to draw inward and pay close attention to our dreams–and to tell stories. Indeed, many indigenous peoples only tell their traditional stories in the winter. As Adamson’s recorded statement about the haunting of the past that chases us until we can learn to face–facing up to it may take considerable courage. But certainly each of our pasts as well as our past as a society will continue to haunt us until we face it. Only then might we gain the wisdom of our past and the power to guide our future with vision. This is the process that traditional stories enable. Today we stand together on the verge of the longest night of the year, which is also the moment when our dreams are strongest. This is the moment when we need stories and their vision– when we need the hearth of community in which elders and young people come together to share their gifts with one another–and with our precious ravaged world. The faith in the returning sun celebrated by solstice ceremonies is more difficult to hold to today, in the face of such things to face as climate change — or the 252 toxins recently found in the umbilical cords of 10 babies. If you were an elder, how you would create the stories that are called for at this moment? What gift would you share? What trust would you express in the actions of the next generation? These questions were answered in the wisdom, generosity, and trust of the speaker at a gathering honoring indigenous environmental knowledge at OSU. Here is the story she created, a story that truly brings us together as it teller Val Goodness notes, in relating a bit about the event where it took place, which she helped to organize. The speaker, Elder Gail Woodside held a handmade clay pot in her hands. This clay pot was decorated by native hands and she proudly said it was her Grandmother’s pot. It showed wear, and even had a small crack, which Elder Gail said happened when her daughter dropped it when she was young. This pot was 100 years old. Elder Gail told us that the pot resembled her Grandmother’s knowledge about things in nature, full and complete knowledge handed down generation after generation through oral history. Her Grandmother’s indigenous knowledge about sustainability and the practice of her father’s use of fire to help things grow. Elder Gail then held the pot up over her head and let the pot drop.We were shocked, and held our breath as the pretty little pot broke to pieces. She said the old ways and the knowledge are broken. Small pieces are used–borrowed from Native peoples– while the rest ignored as un-specialized or not scientific. Elder Gail then asked all of us to come forward and take a piece of the pot. She challenged us all to come back this coming spring to put the little 100 year old pot back together as a symbol of unity in sharing our efforts to present indigenous knowledge in sustainability as an all day event for spring term. So that the knowledge of sustainability can once again be whole. Kiowa writer Scott Momaday once noted that oral tradition is as fragile as it is precious, since it is always “one generation away from extinction”. The story created by Elder Gail illustrates this. It is only the fact that pieces of this precious pot of tradition are in the hands of community that it has a chance of remaining whole. But only if its members are each willing to keep and share and enable their piece so that it remains alive in the whole. Some forty years ago, Paolo Lugari and a group of supporters founded the community of Gaviotas on the llanos-an aluminum-laced plain in Colombia situated between the territories of drug lords, guerrillas, right wing militia and an indigenous people trying to make their life there. In partnership with native people and holding fast to values of cooperation, non-violence, sharing, and reciprocity with one another and with nature, Gaviotas shaped a community that restored thousands of acres of rainforest with astounding biodiversity in a formerly ravaged area. Perhaps the most interesting thing about this restoration is the fact that the community of Gaviotas did not set out to do it intentionally. But as they held to their values of respect for the land and refusal to use chemicals and pesticides, their actions created this magnificent surprise. 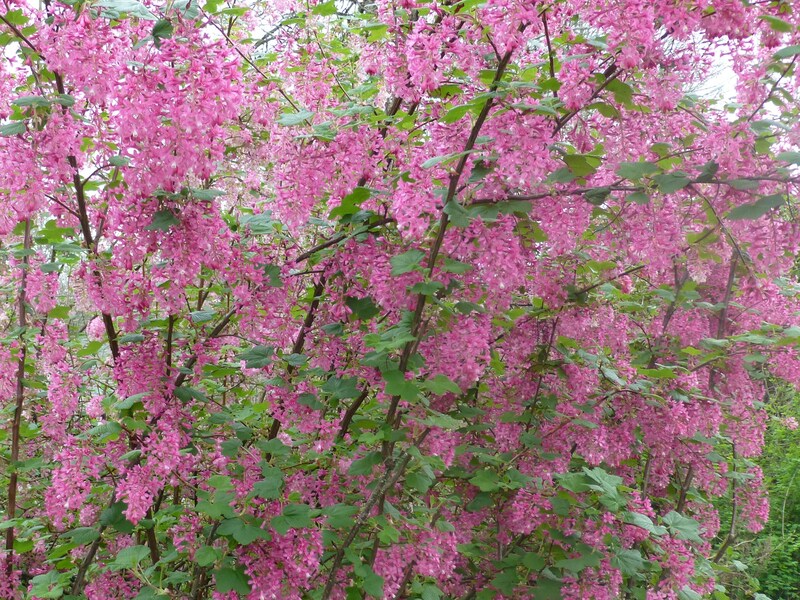 Standing amidst its canopy besides a village where peace reigns in the midst of social turmoil, a bacteriologist declared, “This place is proof God exists”. There is a folk story in which a man asks, “How can you plant a rose in wartime?” The answer comes back: “How can you not plant a rose in war time”? Kenneth Helphand cites this story in his book, Defiant Gardens-Making Gardens in Wartime, in which he describes gardens planted in the worst of times-by the prisoners in the concentration camps in Nazi Germany, for instance, who planted gardens they knew they would not live to harvest. But as these prisoners tended their gardens, they also tended something inextinguishable in their spirits, Like that to which W. S. Merwin refers in his poem, “Place”: “On the last day of the world, I shall plant a tree”. “Plant a tree and plant a new beginning”, says Kenyan Wangari Maathai. Planting trees led this Nobel Laureate and leader of the Kenyan-based Greenbelt Movement, to her courage and her persistence–and the hope that she wants above all to pass on the next generation despite the crushing challenges the future brings. Palestinian-American poet Naomi Shihab Nye expressed the sustaining power of the natural world this way, “The only word a tree knows is yes”. Perhaps all humans, like Nye in this poem, “are born to answer a tree”. Daryl Forde researched an African tale known by many of those sold into slavery that helped them endure the horrors of their oppression. In that tale, the protagonist plants a “life tree” that survives him when he is stolen into a world where he is helpless. However, his spirit revives when his brother comes upon the tree he left behind and waters it. In line with such ancient wisdom some have transformed the “worst places” by finding a way to plant a garden there. West Oakland is one such place, a disaster zone created by the industrialized global economy, where children are subject to lead poisoning, and residents are sandwiched between ports and warehouses, rail yards and diesel truck depots. Seventy per cent of the 30,000 people here live below the poverty line. Five years ago, this was no place to look for a garden. There was no oasis anywhere where children could contribute their labor to an effort that mattered to them while they felt physically secure. But thanks to Willow Rosenthal and a dedicated band of neighborhood residents, that has changed. Rosenthal chose West Oakland as a place to focus her efforts on organic gardening not in spite of the conditions there but because of them. Her effort started with a 2000 foot lot lent to her– and community support. She worked on the supposition that the community contained its own answers to the desperate issues of hunger and pollution that faced them. The first year, they harvested 2000 pounds of quality produce from their tiny garden and their effort grew from there. Today West Oakland sports a Saturday farm stand which sells produce on a sliding scale that begins with zero and offers starts that residents can plant in their back yards, a local composting program where residents can either drop off their scraps or learn to compost them, cooking and gardening workshops, barbecues and other community-wide celebrations, a medicinal garden (established with the help of a local Filipina herbalist), and back yard gardens built and maintained with community effort, in addition to the intensive gardens farmed communally. If ever there was a “hard place” for such a garden, it was North Philadelphia where artist Lily Yeh began her work, in an area over half the original population had recently fled, leaving behind vacant buildings and lots full of garbage-and a remaining population where 32 per cent of the labor force was unemployed, houses were riddled with dangerous disrepair and schools provided the most meager of educations. There was youth violence, high levels of incarceration, homelessness, drug addiction, and prostitution. Why should she come to work in such a place by choice? Yeh was driven by a need to reclaim the meaning of art. Being Chinese, she had witnessed the massacre in Tiananmen Square. Instead of turning away from that horror, she re-dedicated herself to proving the power of art to heal and redeem society. In North Philadelphia, Yeh felt vulnerable, but not discouraged. She recognized her weakness as her strength, since what she could not do alone was an invitation for the community to help her. That help early on included a former drug dealer who seized the opportunity to create real meaning with his labor. Yeh worked on “reconnecting what is broken, healing what is wounded, and making the invisible visible” in the most concrete of ways: by hauling garbage from abandoned lots and replacing devastation with plants and with the beauty of her art-sometimes she transformed the very garbage she found into inspired mosaics. Today, The Village (as it now called), sports fourteen parks, numerous community gardens, educational facilities, a youth theater, offices and a crafts center serving 10,000 low income people whom Yeh’s leadership-through-art helped re-possess and re-build their homes. It all began with the simple idea that Yeh could offer a bit of beauty as a token of respect for the citizens of inner city Philadelphia. 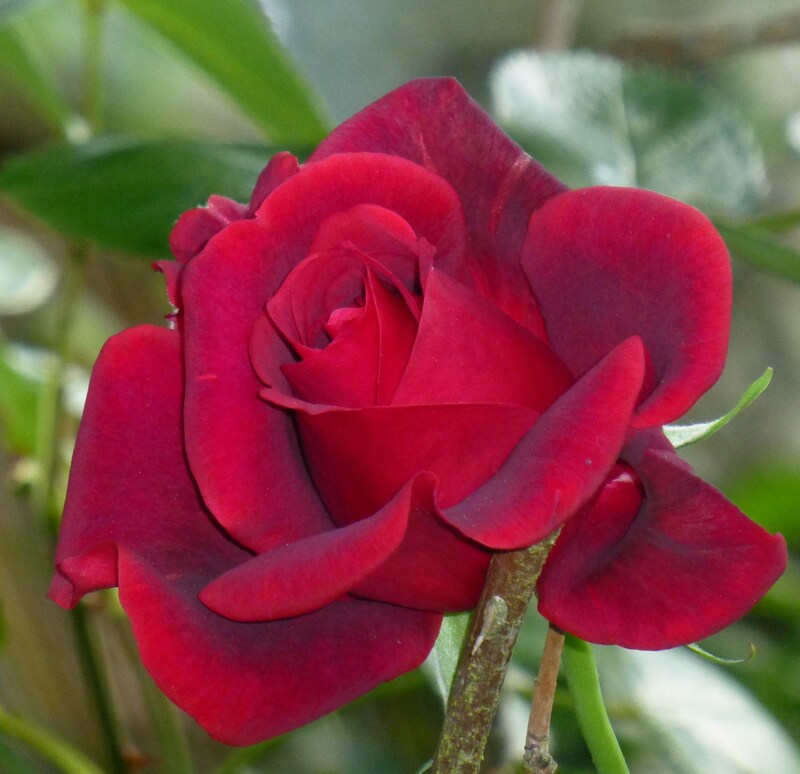 After all, how can you not plant a rose in war time? One day when I visited a Chehalis grandmother that I sat and spoke with many times, she called my attention to the prairie in front of her house. She loved that prairie which brought her the smell of wild strawberries in June and remembered images of her ancestors with their slender digging sticks prying camas up carefully, so carefully, so as not to “disturb the prairie”. Over generations, the careful work of her people and that of other indigenous women resulted in the camas flowers everywhere on the prairies pioneers nicknamed “camas lakes” for their stunning visual effect. But that day the prairie this elder loved was full of shoveled mounds of dirt. It seems that some people on a quest for wild foods had been seeking camas and had tunneled away, turning over and uprooting soil everywhere. It was something I myself did not at first notice, but it was immediately apparent to this woman who in her eighties watched over the prairie just as she watched over the Chehalis children playing outside the tribal hall during recess from the Headstart Program. She had an all too extensive recollection of the assaults on Chehalis identity and language during the boarding school era, but observing these children who “knew who they are”; she could finally say of her people, “I guess we made it”. She had strong eyes with which to do all that watching: ones that could warm you even in the coldest days. Others (non-Indians) advised me to wear a coat when I came to see her in her unheated cedar house. But sitting there before her bright watching eyes, often flashing with glee at a joke, I was never cold. She had plenty of vision with which to observe that those folks armed with shovels had “really messed up the prairie”. This violated her ethic of non-disturbance the same way the sloppy leavings of a modern hunting camp violated the same ethic in Henry Cultee’s eyes. You should take and use all of what you shot-and should there be something you couldn’t use of the animal that had given its life for your survival, you should respectfully bury it. Honoring the life you had taken and leaving the land just as you found it. In this sense the “precautionary principle”, which mandates that we take special care not to disturb other lives now or in the future, is nothing new. Caring for the land and for the people is anciently intertwined in traditional indigenous views in which animals were hunted so that meat could be shared. In some areas of California, the hunter never ate any of his own meat. He could justify taking the life of another natural creature only by giving it away to feed others. In the same way, girls who harvest their first roots berries on the Mid-Columbia River never consume these themselves-but instead give them away. In wisdom gleaned from observing the reciprocity of natural systems, they realize that the one who gives away her first harvest will see nature return the favor to her in future years. What we share of nature and society expresses the content of what environmental philosophers term the “commons”. The commons includes things like air, water, transportation and storm water systems upon which modern developers depend-and for the Chehalis grandmother, the prairie in front of her house. That commons differs radically from “private property”. What was truly “private”shouldn’t matter to anyone else. Thus the grandmother above thought it as peculiar as it was insulting that social service folks had knocked on Indian doors with the purported purpose of teaching Indian women how to arrange their housekeeping. Once the word got out, the Indian women they targeted didn’t let them in the door. Digging up the prairie by any means convenient and intruding on the home life of Chehalis people to proffer their re-arrangement both violate the ethic of non-disturbance shared by many native cultures and the modern precautionary principle–originally called “fore-caring”, in that it was caring for the future. It was the same kind of violation that saddened the Chehalis grandmother when she had, years before, gone to visit someone at the state mental institution at Steilacoom. She was indignant that the inmates could be “paraded around like that-human beings!” She did not recall that there were many who were “lost to us that way” before contact, but when there were, her people would work to “bring them home again”. To bring them, that is, back to a place of honor and belonging, to include and embrace them rather than to isolate and regiment them. There is exemplary tenderness in this stance: in the stance that honors all life exactly as it is– and understands disease as lack of belonging. Instead of remaking the world for its own purposes, this stance attempts to enlarge itself to embrace those who have been left out, thus bringing them home again. Imagine a science that worked with this kind of tenderness toward our world. It is a possible vision. Indigenous Community Conservation Areas now account for a substantial portion of the world’s lands (up to an estimated twelve per cent), and they include global areas with the largest cultural and biological diversity (“biocultural diversity”). Such areas are managed in terms of the ancient partnership between native peoples and their land. Imagine if global development and technology turned to such tender caretaking: what if we defined “progress” as enlarging ourselves, embracing others (including natural systems) as they are? What if we exhibited such tenderness and watchfulness over our social and ecological worlds? What if we instituted the precautionary principle in all aspects of our lives, combining the stance of non-disturbance with intimacy (so that we have the knowledge to understand whether or not we are disturbing others) and the watchful protection that many indigenous worldviews have modeled? If we honored our own potential in this way, then perhaps we might begin to expect our actions in this vast mysterious world to yield unexpected positive consequences rather than the unintended negative ones we all too often face today. Like those in the community of Gaviotas in Colombia, who have worked so carefully to be in harmony with their environment that thousands of acres of recovered rainforest have serendipitously risen up in their wake. Imagine what daily life might be like if we expressed such tenderness towad our environment that we woke up each morning expecting wonderful surprises– and secure in the sense that those who followed us would inherit an even more vital world than the one that sustains us. This is a vision that all of us might work to make a reality.